Using a Soundbar or Under-TV audio system to improve TV sound is now extremely popular, with a growing number of consumers optioning for installation convenience and less clutter than with a full multi-speaker setup. However, one of the drawbacks is the diminishing of the surround sound experience. To counter that problem, Yamaha's Digital Sound Projection technology provides a possible solution. Digital sound projection is an audio platform that uses an array of small speaker drivers (each with its own amplifier) housed in a single cabinet that looks like a sound bar or under-TV audio system. The "beam drivers" (tiny speakers) project sound with directional accuracy from the front to the main listening position as well as to the side and rear walls of your room which bounces back into the listening space to create a realistic 5.1 or 7.1 channel (depending on model) surround sound field. Provided you have a closed room and flat ceiling that allows for good sound reflection, a digital sound projector can provide a surround sound field that is convincing. However, Yamaha adds an additional twist with the YSP-5600, by taking digital sound projection platform up a notch with the addition of vertical channels. What this means is the YSP-5600 can be configured for a 7.1.2 channel setup that meets Dolby Atmos requirements. For those not familiar with Dolby Atmos speaker layout terminology, this means that the soundbar will project 7 channels of audio in the horizontal plane, along with a woofer/subwoofer channel, and also project two sound channels vertically. DTS:X to be added via free firmware update). Additional surround sound support is provided by Yamaha&s DSP (Digital Surround Processing) Modes (Movie, Music, Entertainment), as well as additional listening modes (3D Surround, Stereo). Also, a Compressed Music Enhancer is provided that improves sound quality on digital music files, such as MP3s. 44 beam drivers (12 tiny 1-1/8 inch and 12 1-1/2 inch speakers) each powered by their own 2-watt digital amplifier, as well as two 4-1/2 inch 40-watt woofers. Total power output for the system is stated as 128 watts (Peak Power). All of the speaker drivers are front facing, with the vertical firing drivers located near each end of the unit. 2 digital optical, 1 digital coaxial, and 1 analog stereo (3.5mm) input. There is also a subwoofer line output provided for connection to an optional external subwoofer if desired. With regards to the subwoofer output feature, the YSP-5600 also has built-in wireless subwoofer transmitter. To use this feature, users have the option of purchasing the Yamaha SWK-W16 Wireless Subwoofer Receiver Kit (Buy from Amazon) that can connect to any subwoofer. Yamaha suggests its NS-SW300 (Buy From Amazon). For video, the YSP-5600 provides 4 HDMI inputs and one HDMI output, 3D and 4K pass-through with HDCP 2.2 copy-protection (necessary for compatibility with 4K streaming and Ultra HD Blu-ray disc sources). However, there is no information regarding HDR compatibility. The YSP-5600 also includes both Ethernet and Wifi connectivity provides local network content access and internet streaming (such as Pandor, Rhapsody, Spotify, and Sirius/XM). Also, Apple AirPlay and wireless Bluetooth are included. The Bluetooth feature on the YSP-5600 is bi-directional. This means that you both stream music directly from compatible source devices, such as smartphones and tablets, as well as stream music content from the YSP-5600 to compatible Bluetooth headphones or speakers. A big bonus feature is the incorporation of Yamaha's latest version of its MusicCast multi-room audio system platform. This platform enables the YSP-5600 to send, receive, and share music content from/to/between a variety of compatible Yamaha components that include home theater receivers, stereo receivers, wireless speakers, soundbars, and powered wireless speakers. This means that not only can the YSP-5600 be used for improving the TV sound experience, but can be incorporated into a whole house audio system. For control flexibility, the YSP-5600 can be operated by the included remote control, or via compatible smartphones and tablets using the free Yamaha Remote Controller App for iOS or Android. In addition, it can also be integrated into custom control setups IR sensor in/out and RS232C connection options. 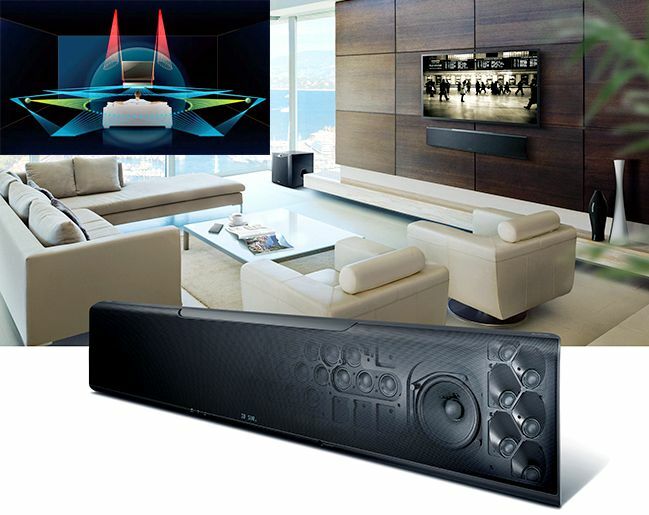 The YSP-5600 definitely signals an advance in the soundbar concept. Having experienced Yamaha's Digital Sound Projection technology since its original introduction some years ago, it is definitely an effective platform for providing a surround sound experience without all the hassle of a separate home theater receiver and individual speakers in a closed room - but it is definitely more expensive (more in line what a receiver/speaker setup would cost) than a traditional soundbar. Also, keep in mind that even though the incorporation of Dolby Atmos, DTS:X, and MusicCast are definite bonuses, if you want the full home theater audio experience, you still need to add a subwoofer at extra cost.